Our goal is to help you be more knoweledge in your dog wellness in order to prevent illness. What are the benefits to feed raw dog food? 2. Your dog will stop smelling like a dog! 5. Less digestive issues - dogs can't digest grains which most kibble foods contain. 6. Puppies follow their natural course of growing, without having bursts of growth. 7. Healthier skin and shinier coat, no more fur loss, itching, skin rashes, irritations or very dry skin. What if my vet does not support raw food diets? 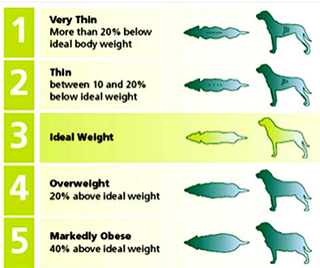 Being overweight is as bad for a dog as it is for a human. excess weight - it can shorten their life. A dog for excess weight certaintly live a lesser quality life. Please take this seriously. Can I Give My Dog Distilled Water? Distilled water has had all the minerals removed, making it completely free of any chlorine or other minerals. It’s often suggested to use this to relieve small dogs such as Maltese from having runny tear ducts. But it’s not all good and choosing bottled spring water instead of distilled water is a much healthier choice for your pet if you don’t want to give them tap water. In distilled, all the mineral content of the water is destroyed during the distilling process and it would be safe to give your dog one to two times a week at the most, the rest of the week offer tap or bottled spring water. What Damage Can Distilled Water Do To My Dog? There have been reports of potassium deficiency and heart problems related to dogs that are only offered distilled water. This is because the minerals have been completely removed. The minerals in water offer dogs strong muscles and if you only have the choice of giving your dog distilled water, find out from the vet what supplements you can give to ensure your fluffy friends are getting their daily intake of minerals that is needed to stay healthy and strong. While no harm has been reported in dogs that were given distilled water a couple of times a week, giving it on a daily basis is not a good option. DO NOT GIVE YOUR DOG DISTILLED WATER ON A DAILY BASIS!!! GIVING DISTILLED WATER DAILY IS VERY DANGEROUS!!!! Giving distilled water to your pet once or twice a week for an internal cleanse/tear stain controller is fine. Spring water is fine.